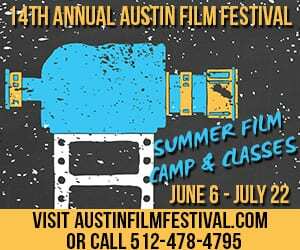 The Summer Film Camp, presented by Austin Film Festival, returns this June with an amazing camp full of screenwriting, filmmaking and claymation workshops for ages 9 – 18. The critically-acclaimed program promises to teach, inspire and help kids and young adults create their very own fabulous, funny, thought-provoking and heartbreaking short films. Camps are offered from June 6 – July 22 at St. David’s Episcopal Church. When it comes to AFF, the Summer Film Camp is all about storytelling. In this immersive and creative environment, campers will turn their stories into their very own movie. These workshops are designed for aspiring filmmakers and taught by professional filmmakers. There is something for everyone at this camp. Are you an artist? Come learn how to storyboard. Are you a technical prodigy? Come discover the power of getting just the right shot or recording the perfect sound. Want to be in front of the camera? Come play a part (or two). The best thing about AFF Summer Film Camp is that everyone gets a chance to do everything. Kids will also get to meet exclusive guest speakers that are major Hollywood writers, producers or directors. And finally, to finish it all off with a bang, AFF will host the Summer Camp Showcase – where students who attended camp will get to show off their hard work and short films on the big screen. Family and friends are all invited to join in the fun. You can click here to learn more about these camps and check out the full day or half day schedules. You can also register online here and get info about their scholarship program. For more information, please visit the Austin Film Festival website.